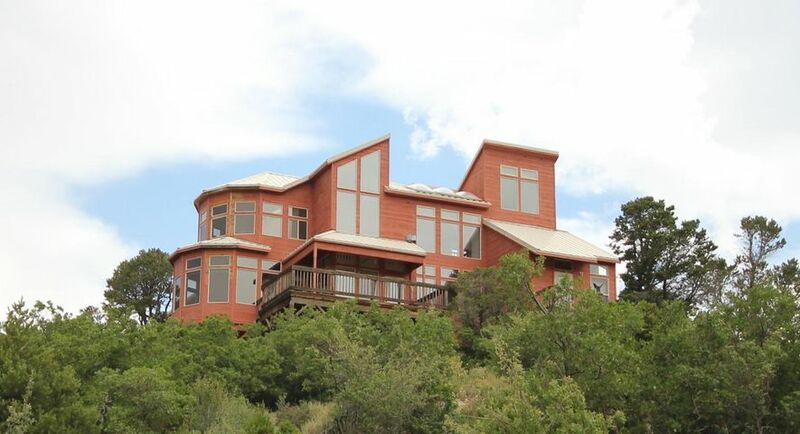 "Beautiful large home on over 28 acres of serene beautiful property! Great home for entertaining! Large deck to enjoy the views and quiet setting. 4-car attached garage, Large kitchen, large detached workshop/garage. Home is being sold ''as-is'' with no warranties or representations expressed or implied." 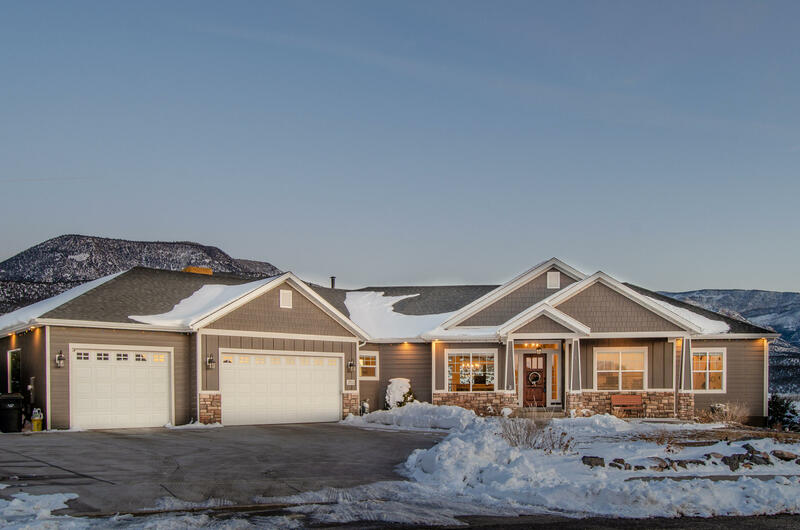 "Spacious luxury craftsman home designed by acclaimed architect, Steve Wunderlich (4C Design Group - Los Angeles/Park City). 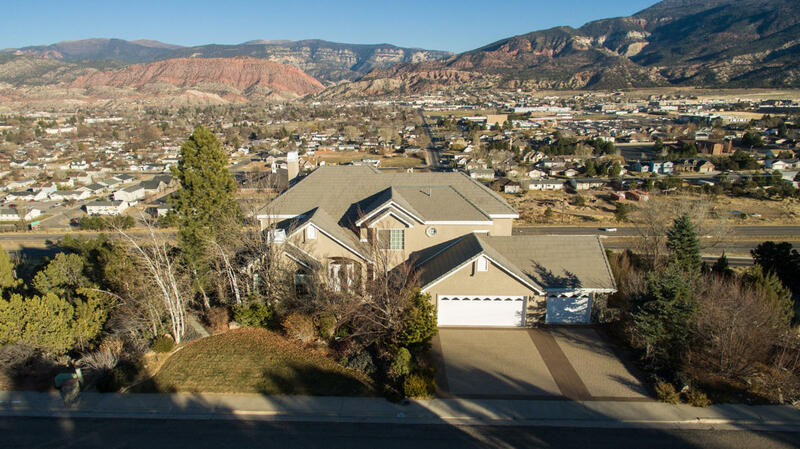 Built on premier canyon lot overlooking golf course community with unparalleled views of mountains and valley. Beautiful hardwood floors throughout, immaculate woodwork and ceiling design, wrap-around porch. Every detail is thought out in this amazing home. See Virtual Tour!" "''Beautiful Stately Country Manor'' on an acre in Flyin' L Ranches! Every detail has been considered! Nothing overlooked! Excellence thru out! The house has it all! Beautiful mature secluded grounds with full size Sports Court, Play ground, waterfall, fire pit, etc., enjoyed from and x-large Covered Deck. You'll never want to leave! HOA dues $200/year + water $300/year. A Must See!" 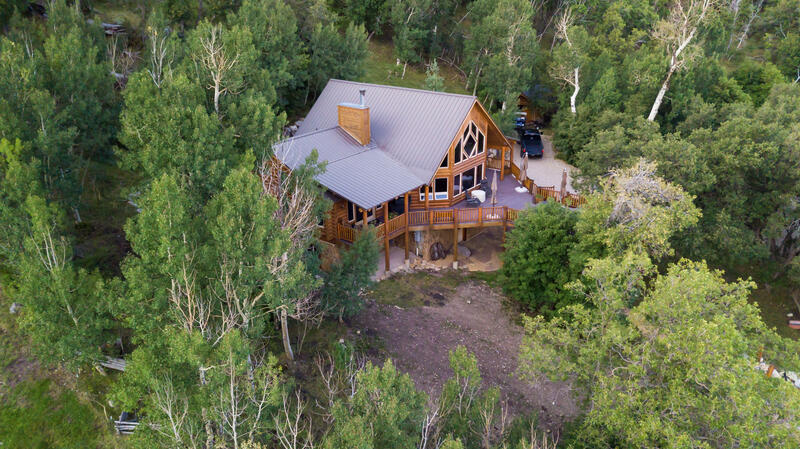 "Beautiful custom built 10 inch log home on an amazing lot with breathtaking views and a private natural pond with fish. Endless deck space, custom details throughout the entire property, oversized 2 car garage, additional shed and lots of storage in the basement. Horse property up to 3 horses. See video Water shares are not included with the sale of the prope"
"This elegant, five bedroom home sits on over half an acre, overlooking the valley and nearby golf course. The kitchen opens up to the covered deck with mountain and valley views, and includes a staircase leading to the lower patio. In the basement is a living area, 3 bedrooms, storage space, and a large theater. This home also includes an over-sized garage, 2 central air units and 2 furnaces." "Luxury awaits in this stunning pool home with tranquil waterfall and outdoor kitchen. Spend cool evenings around the outdoor gas fire pit or head inside and gather around the cozy fireplace. Full gourmet kitchen & laundry area in the completely finished basement. LOADS of garage space for your car enthusiast. Attached garage holds 2 cars & heated detached garage easily holds 5 more." "Living is easy in this impressive spacious home. The open floor plan encompasses 7 bedrooms and 4 full bathrooms. An open and stylish family friendly kitchen that flows through the dining room and expansive multi level living room.. The master bedroom & spacious master bath and walk-in closet, ensuring parents have a private space where they can enjoy quiet evenings." 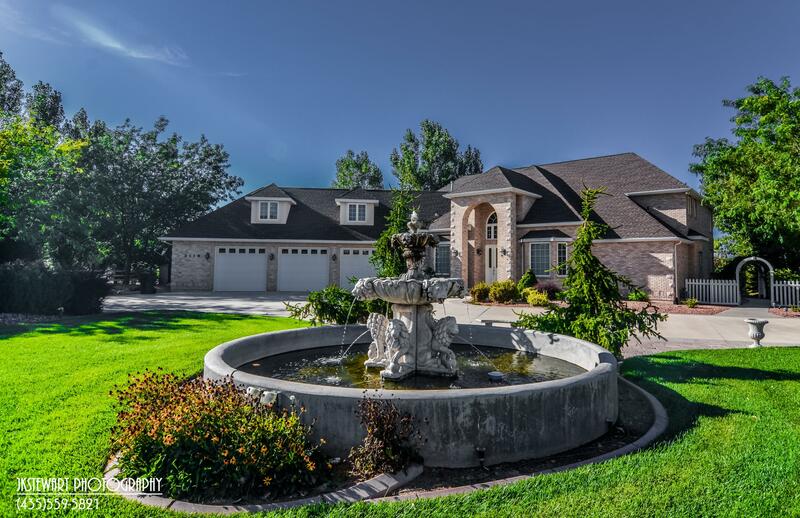 "This large family home is located at the golf course and backs up to the park. Six bedrooms and 3.5 bath4, formal dining and large office. Master bedroom on the main level with large bathroom and closet, Laundry room off kitchen. Basement has large TV/game room and a second master suite. From the kitchen you can walk out onto the covered deck, great view of the mountains. Second laundry located"
"THE BEST VIEWS IN SOUTHERN UTAH! 360 degree views from this top of the world home! At 5.85 acres, this largest parcel in Cross Hollow Hills has views East to Shurtz Canyon & sunrise; West to valley & sunset. Simply decorated, this home is a blank slate for your masterpiece. 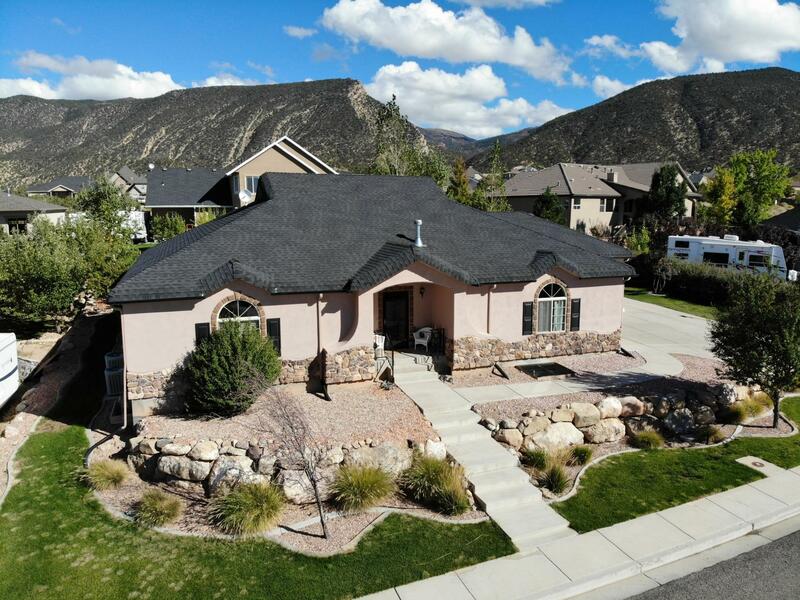 Little used & well cared for, this custom home was built w/highest quality construction & detail incl: copper pipes,"
"This beautiful,custom home is nestled in the serene mountains of the Cedar Highlands Subdivision. Designed by a pilot,the panoramic window walls in the dining room and one of the dens creates majestic and unparalleled views of the 1.12 acre property and beyond. The meticulous construction and craftsmanship features wood beams, built-in bookcases,and a spiral staircase." "Holy Mini Ranch! Come get your future charming country home, wrap around porch. On 4.4 acres fully fenced. On natural gas, 5 AF irrigation well water and culinary water from Spring Creek water co. 36'x48' insulated/heated barn. Farmhouse has 2x6 walls, solid oak flooring in main living areas, central vac throughout. Upstairs rooms both have a balcony with views for miles." "A 2014 Parade Of Homes, Home complete with all of its custom features and upgrades is now available to be yours. 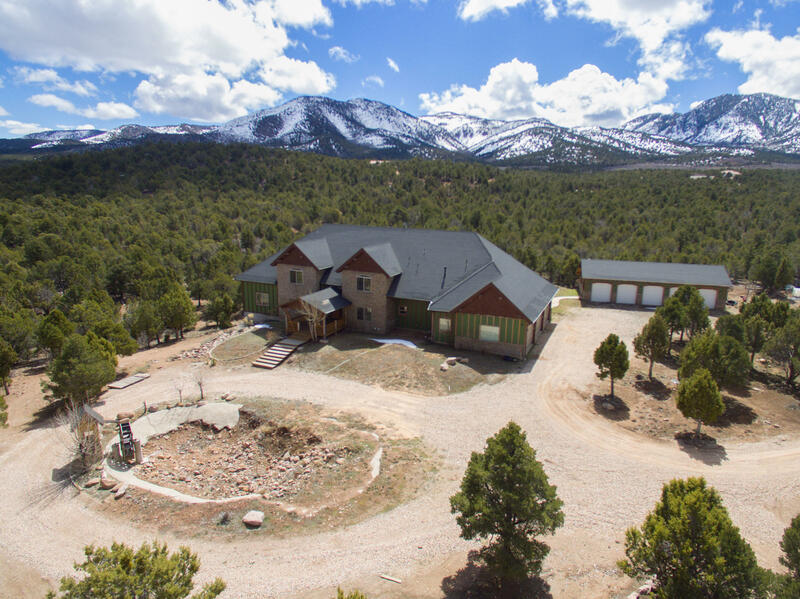 This stunning setting with views of Shurtz Canyon with its spires and red rock outcropings in the highly desired Eagle Ridge at South Mountain development. 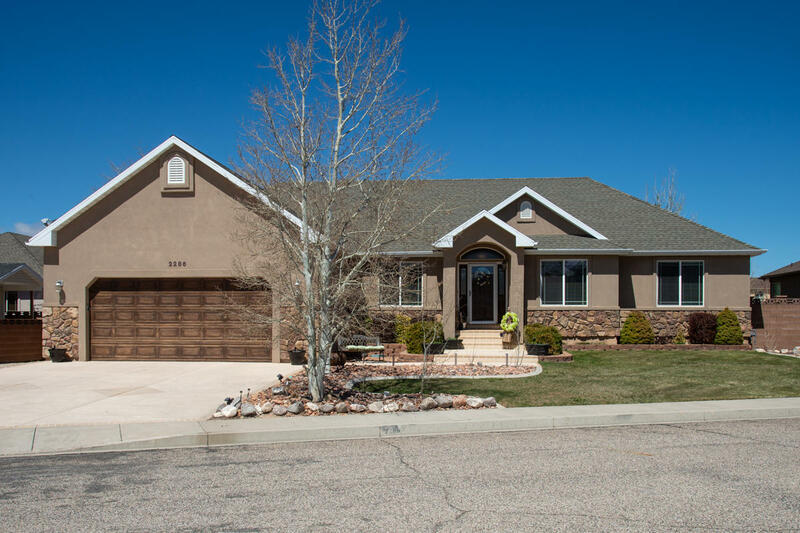 This 4 car garage including 4 bedroom 3 1/2 bath home offers everything a demanding home owner might look for. Including a Control"
"Come fall in love with this beautiful property on the corner of a fantastic neighborhood! 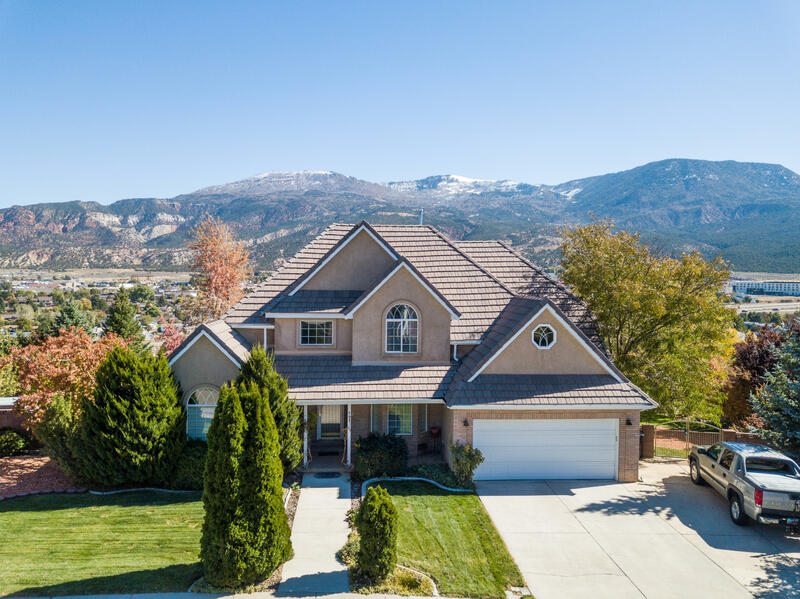 With breathtaking mountain views! Filled with 9 and 10 ft. ceilings. Close enough to shopping and schools, but far away enough for a quiet life. Fully landscaped, huge lawn and lots of trees. Basement wood burning stove and separate furnace/AC units for up and down stairs. Theater, intercom and audio systems!" "This home has it all! Spectacular views, open floor plan, gorgeous yard! Make sure to check out the virtual tour. Granite counters, formal dining room, tons of storage, walk out basement with wet bar and family room as well as a full master suite in the basement. Walk out of the basement to the covered patio with built in BBQ. You can't beat this view, home is just South of the LDS temple." "Custom Home for sale in Mesa Hills. 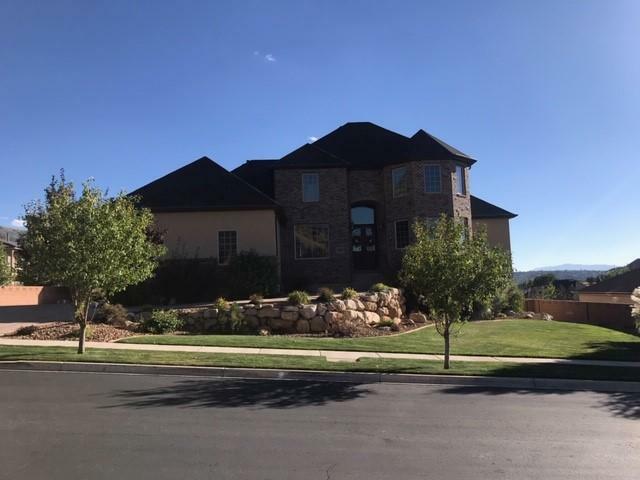 This home has lots of extra's, 7 bedrooms (Master bedroom is on upper level), 4 1/2 baths, dining room, 3 living rooms, Hair/tanning salon, 2 storage rooms, Beautiful Custom Kitchen Cabinets, Open Floor plan on main level, Large 3 car Garage and your very own private covered Swimming Pool. Please call listing agent for showing details and appointment. 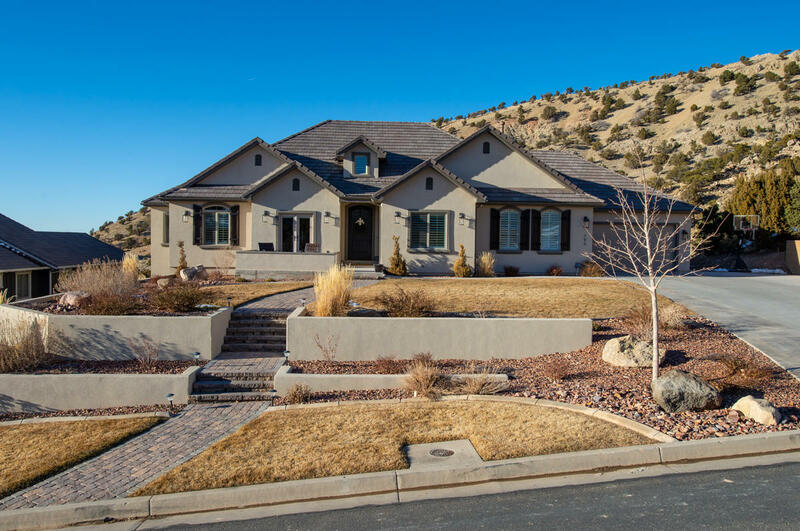 Home is a"
"6 Bedrooms , 3 full baths +2 half bath home finished with stucco and stone veneer, tile roof and totally landscaped. 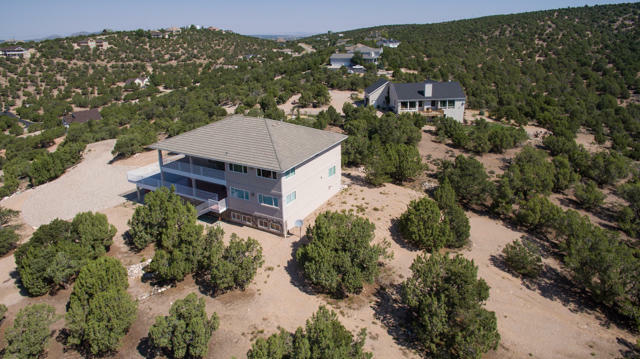 This home sits on an .49 ac. elevated lot overlooking the golf course. You enter the home through a formal entry hall with a parlor off to the side keeping visitors away from the main living area. The interior rock veneer and wood beam accents set a comfortable atmosphere." 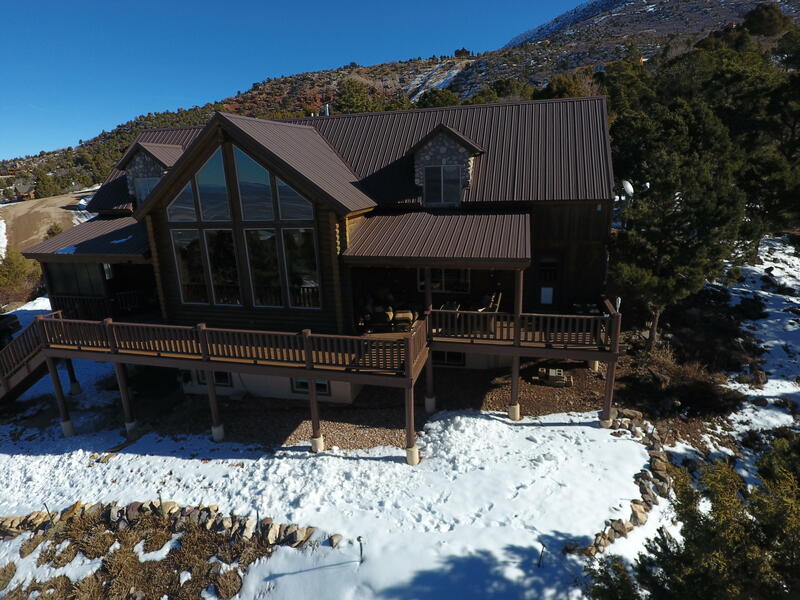 "Luxury mountain cabin just 10 minutes from Cedar City. This cabin features amazing views in all directions. The home features an amazing upgraded kitchen with a large island, granite countertops, and GE cafe appliances. The cabin also includes a highly upgraded master suite with radiant in-floor heating in the bathroom, granite countertops, double sinks, self cleaning steam shower. Must see!!" "Stately two story home in a great location. Enjoy great views from the large front porch and backyard. Backyard landscaping features over 20 rose bushes, gazebo, and pond. 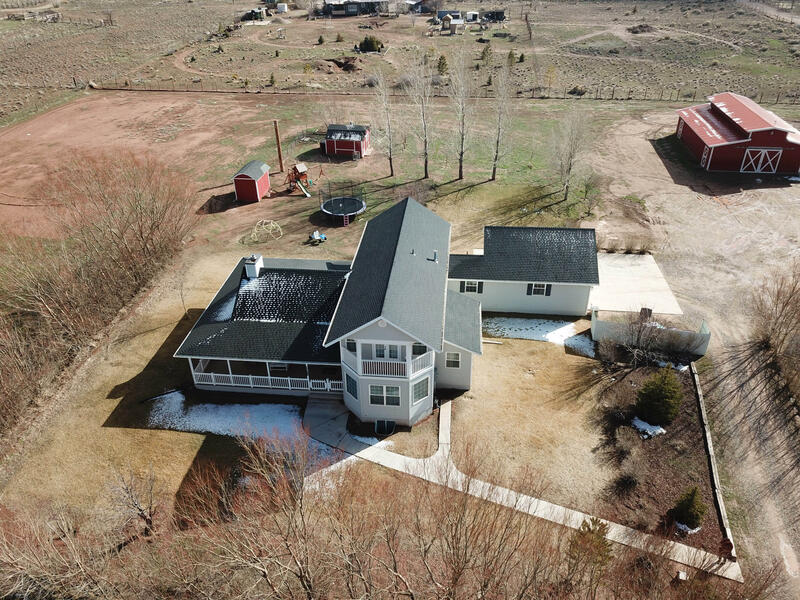 This home has so much room, it even includes an extra garage with a framed, plumbed and dry-walled apartment above, see photos. This home has so many extras, must see home!Free appraisal offered by preferred lender." 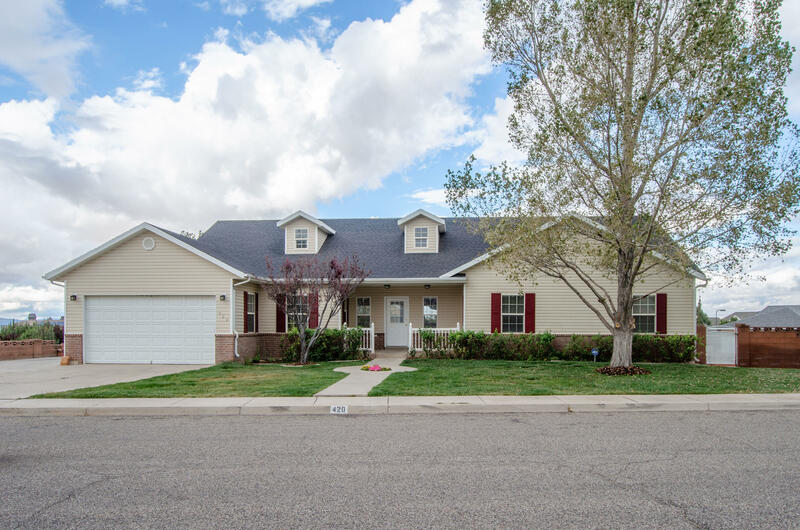 "This very spacious beautiful home features: 5bed plus 2 extra rooms/3bath, full block wall.Home has been completely repainted, brand new carpet, new light fixtures, new exterior shutters, garage has been re-textured & painted, etc. 2nd possible kitchen in basement, currently a spacious wet bar/mini kitchen. Must See! 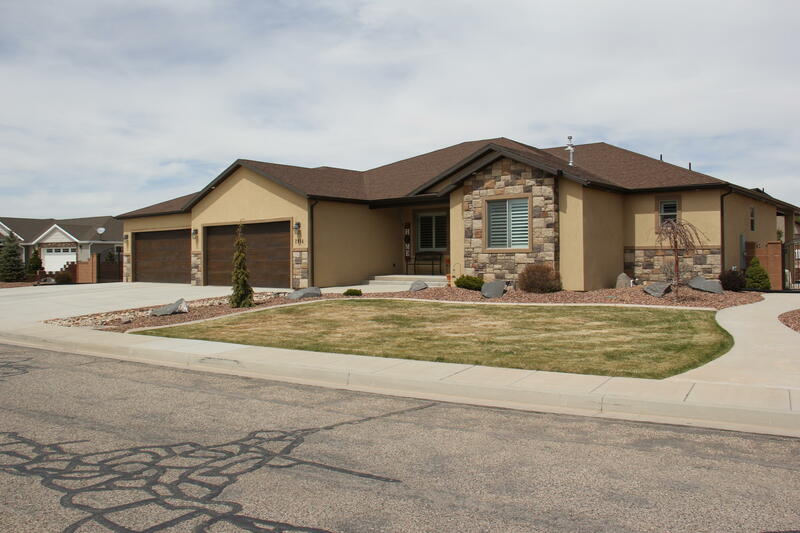 Located in Desirable, Mesa Hills subdivision. Don't miss out on this one"
"WOW! You will love this home. Featuring extra amenities. Two master bedrooms on the main level, a wonderful boutique/office with stairway entrance from the garage, a theater room, and a downstairs kitchenette. fireplaces insert and wood stove. Also included: reverse osmosis water filter, solar hot water, whole house humidifier and air cleaner and wired cable throughout home." 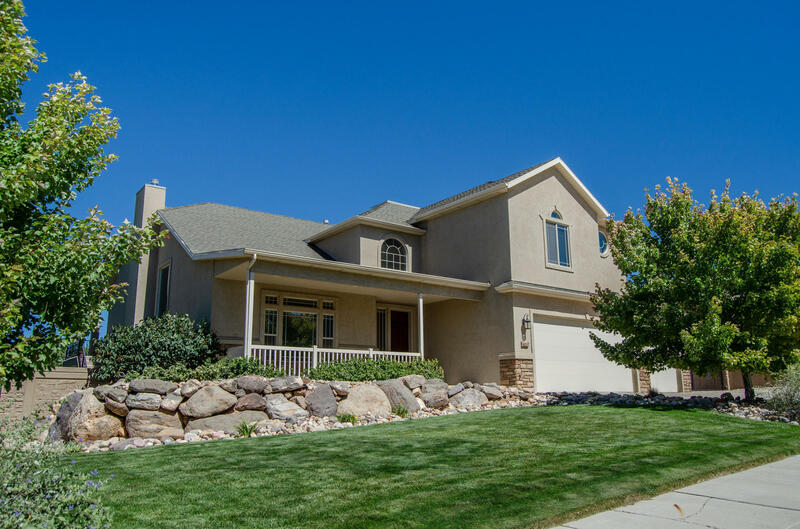 "This gorgeous three story home overlooks Cedar Valley-- enjoy from any of the three covered balconies. Inside, there's space enough for the whole family. There is a sauna and jacuzzi, and granite in the kitchen. In the basement, the wood floors would be perfect for a dance studio, or exercise room or art studio." 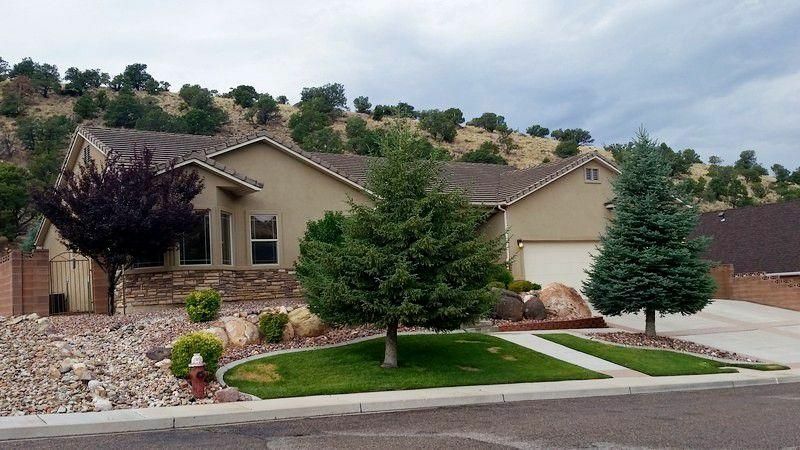 "Do you want a home in an established neighborhood, lots of space, rich hardwood floors, master on main, amazing mountain and city view, large back deck, walkout basement, and beautiful yard? This home is your new home. The lot behind is also for sale." 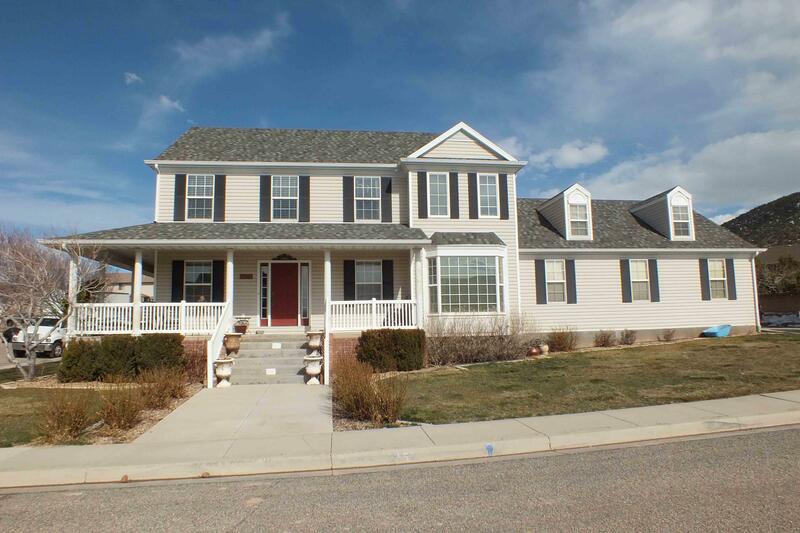 "Stunning 5 bedroom/3 bathroom house located in the Legacy Park subdivision! Includes a large family room and kitchen with a smaller living room just off the entry way. All stainless steel appliances in the kitchen, a large island, ample cabinet space, a walk-in pantry, and high ceilings throughout! Basement includes another living area, a laundry room, a large kitchenette and two spacious bedrooms"